When NASA’s Mars Rover Opportunity sends a photograph of the alien landscape back to Earth, it relays the information as digital data, a series of ones and zeros that computers assemble into images that we can see. What if the same thing could be done for an alien life form? What if a robot could quickly decode an alien’s genome and stream the digitized information here? “We’d get Martians back in as little as 3.4 minutes, instead of having them splash down in the ocean,” said J. Craig Venter, one of the foremost geneticists in America. For Venter, genetics and big data make everything possible. 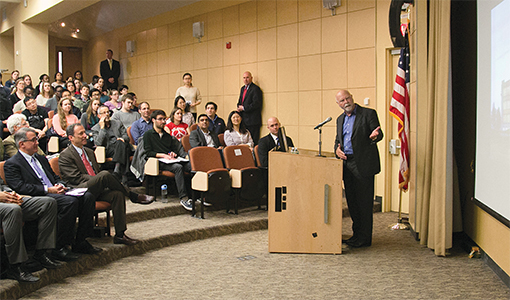 He delivered the President’s Lecture at Tufts on March 10, speaking about his work and where he sees science heading. Among the first to sequence the human genome, Venter is founder, chairman and CEO of the nonprofit J. Craig Venter Institute, and founder and CEO of the privately held Synthetic Genomics Inc. in La Jolla, Calif., which seeks to improve human health and develop new sources of energy and clean water. Venter’s latest endeavor is Human Longevity, a start-up company that will address the genetics of aging, which, he points out, is the single biggest risk factor for virtually every significant disease. Researchers at Human Longevity will use two state-of-the-art sequencing machines capable of processing 40,000 human genomes per year and generating vast amounts of data that may offer insights into how to slow aging and related disease. “Genomics is not really the hard part of it now,” Venter said. “The hard part is defining who you are, what you’re made of.” Teams of scientists at his company and elsewhere, including physiologists and psychiatrists, are working to match human traits with specific genomes. The massive quantities of data should give scientists clearer insight into age-related and chronic diseases, including cancer, cardiovascular disease and Alzheimer’s. One of those questions, he said, will have to be who we are not. For instance, after you eat a meal, 10 percent of the chemicals that help you digest the food come from bacterial species known collectively as microbiota. These vast numbers of microbes colonize the human body and provide us with essential services such as extracting energy from food and protecting us from infection. Researchers have shown that changes in the microbiome are linked to cancer, chronic diseases such as diabetes and even obesity. Venter’s team, in collaboration with doctors at the Moores Cancer Center, is starting with cancer. Patients who come into the cancer clinic at the University of California at San Diego, where Venter received both his bachelor’s and Ph.D., have agreed to have their genomes and their tumors sequenced. The personalized nature of this data has led to some medical breakthroughs. For example, Japanese researchers have discovered that 4 percent of lung cancer patients carry a genetic variant that makes their tumors quite treatable. Those patients could not have been saved without large-scale genomic sequencing. Venter isn’t just using computers to decode biology. He sees the relationship between biology and computing as reciprocal. Among his many distinctions, Venter led the research team that created the first synthetic bacterial cell. Venter and his team started small, inserting a short chain of synthetic DNA into common E. coli bacteria. The bacteria easily assimilated the foreign DNA—something bacteria do all the time in nature—and followed the DNA’s encoded instructions to produce a specific set of proteins. In turn, those proteins killed their host and infected neighboring cells, repeating the process. Using this approach, Venter’s company has made disposable containers out of biodegradable sugars instead of the petroleum-based plastics that will hang around in landfills for centuries. They’ve also engineered algal cells that are three times more efficient at turning sunlight into energy than nature-made cells. Venter spoke about how he and his colleagues used sequencing technology to design a new vaccine for the deadly meningitis B strain that was recently approved for use in Europe. Because the scientists sequenced various species of the meningitis virus, they were able to engineer a vaccine that protects against all of them. They’re expanding the work to influenza viruses. Venter’s team has already sequenced the H7N9 strain found in Mexico, allowing scientists to get a synthetic vaccine into clinical trials before the first infection hits the United States. “For the first time, the U.S. is ahead of this game,” Venter said. If you’re imagining heading to CVS for a dose of that vaccine, you’re not thinking like Craig Venter. He envisions a time when we’ll be able to download tailor-made vaccines—like that Martian DNA—in the comfort of our own homes, something that could help stop the spread of potentially deadly viruses. “We could stop a pandemic before it even starts,” he says.